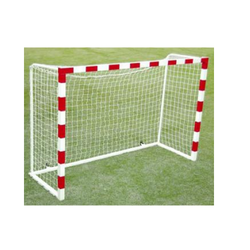 We have captured the global market as the manufacturer and exporter of Handball Goal Post. The products are ideal for every sports field and are impeccable in strength and durability. They are provided with strong nets resistant to wear and tear. - Project Prices: "INR 43, 857/- (Ex-Delhi) (Exclusive of Tax, Octroi, Local Freight)"
We are offering Handball Goal Post to our clients. Asko Red and White Handball Goal Post, Size: 3mtrx 2mtr x1mtr. - Main frame made of 3 x 3 square, 2 mm thick GI Pipe. - All other support pipes are of 1 ¼ inch outer dia round pipe. - Comes with hook for hanging the net. - Comes with attractively painted in Zebra Stripes as per customer requirement. - Size as per International specification. Packing, Forwarding and Sales Tax extra. 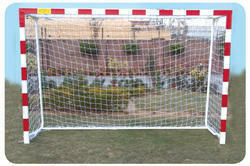 Our company has created a niche in the field of offering Handball Goal Post.